The Northern California 9/11 Truth Alliance will hold its annual 9/11 Truth Film Festival entitled 9/11 Reclaiming the Truth, Reclaiming Our Future this Thursday, September 8, beginning at 1:00 pm at the Grand Lake Theater, 3200 Grand Ave., Oakland, and on Sunday, September 11, beginning at 1:00 pm at the Herbst Theatre, 401 Van Ness Ave., San Francisco. Speakers include director of Project Censored Mickey Huff, president of the Media Freedom Foundation Dr. Peter Phillips, sister of fallen firefighter David Weiss from Rescue One and founder of Unite in Peace Michele Little, author of Mounting Evidence: Why We Need a New Investigation of 9/11 Dr. Paul Rea , author of Earth into Property: Colonization, Decolonization, and Capitalism Prof. Anthony J. Hall, author of Waking the Global Heart: Humanity’s Rites of Passage From the Love of Power to the Power of Love , Anodea Judith, author of Building the Green Economy: Success Stories from the Grassroots , Kevin Danaher, author of World as Lover, World as Self – Courage for Global Justice and Ecological Renewal , Joanna Macy, filmmakers Ken Jenkins and Brett Smith, and radio hosts Bonnie Faulkner from “Guns and Butter,” Carol Brouillet from “Community Currency” and Sherry Glaser-Love from “Our House!” In addition to the films “Psywar: The Real Battlefield Is the Mind,” “You, Me & the SPP: Trading Democracy for Corporate Rule,” “Loose Change 9/11: An American Coup,” “Hypothesis: A Documentary about Prof. Stephen E. Jones,” and “9/11: Explosive Evidence ­ Experts Speak Out,” there will be live streaming from 9/11 events in Toronto and Seattle. The Toronto Hearings , sponsored by the International Center for 9/11 Studies, will be held at Ryerson University for four days beginning on September 8th. These hearings will examine evidence for the inadequacy of the U.S. government’s investigation and will request that a full and impartial investigation be launched into the events of 9/11, which have been used to initiate military invasions and to restrict the rights of citizens. The founder of Firefighters for 9/11 Truth, Erik Lawyer, is organizing ONE: The Event – Shifting from Fear to Love, a three-day event in Seattle designed to encourage the choice of “love over fear, kindness over anger, and responsibility rather than blame.” Additional actions and events will be held in the Bay Area, Montreal , Los Angeles , and New York . The diverse range of speakers agree that the official 9/11 Commission Report and the NIST Reports on the destruction of the World Trade Center buildings are not believable and that an independent investigation into 9/11 is needed. Those organizing the Toronto Hearings plan on issuing their own report, based on the independent research that has been done, primarily by citizens over the past decade, along with their analysis and critiques of the official reports. The evidence suggests that those most responsible for 9/11 were promoted, rewarded, profited from the attacks, that no one was reprimanded or held accountable, and that others were scapegoated unjustly for their alleged involvement. 9/11 Reclaiming the Truth, Reclaiming Our Future is a benefit for the Northern California 9/11 Truth Alliance , whose purpose is to explore the truth of 9/11, to honor the dead and dying, and to share stories, insights and research about that day, the forgotten history that led up to it, and the decade that followed. The stated mission of the group is ” to seek and disseminate truths about the terrible crimes committed on September 11, 2001, exposing gaps and deceptions in the official story, and to thus inspire more eyewitness revelations, truthful media coverage, and a movement that will bring the responsible criminals to justice and eliminate governmental and corporate policies that enable criminal elements to commit such acts.” Tickets are $10 ($7 for seniors, students, and low-income) at the door and are available in advance through the Grand Lake Theater website and for the Herbst event through the City Box Office . A tentative schedule with details about the speakers and films is posted here , however it is subject to change as the program needs to be coordinated with the events in Toronto and Seattle. 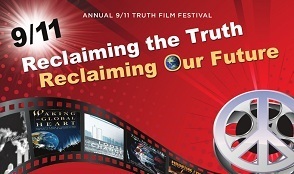 The 9/11 Truth Film Festival is endorsed by 911Truth.org, Project Censored , Media Freedom Foundation , Peace Resource Project , the BFUU Social Justice Committee , WeAreChangeTV.us and the Grand Lake Theater .